ROSCOMMON, Mich. – There never was a doubt about the quality of the 18 holes at Forest Dunes. The course has consistently been ranked as the No. 2 public layout in golf-rich Michigan, behind Arcadia Bluffs. A Tom Weiskopf design that opened in 1999, Forest Dunes is –in the words of general manager Todd Campbell — “in the middle of nowhere.’’ Still, the national course raters have found it. Golf Digest had it No. 20 among America’s 100 Greatest Public Courses for 2011-12 and No.99 among America’s Greatest 100 for the same period. GolfWeek ranked Forest Dunes No. 87 on its Best Modern Courses list. And, in August of 2013, Golf Magazine added Forest Dunes to its Top 100 Courses in the U.S. Forest Dunes made that prestigious poll at No. 72. Despite consistent recognition from raters, Forest Dunes has spent most of its existence in limbo – until now. 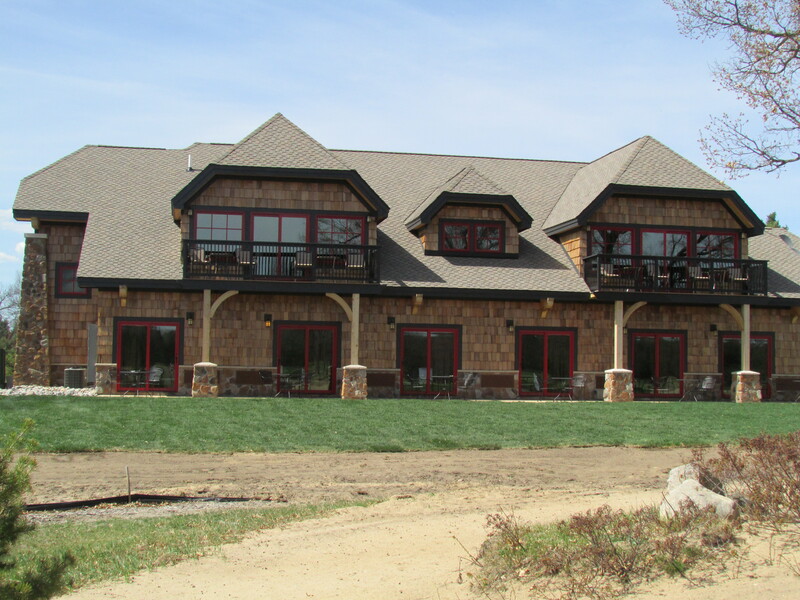 The new Lake AuSable Lodge (pictured above) opened in April and every room was sold out the first two nights. The opening of the $1.5 million facility, built in just seven months, is the most significant new addition to the Michigan golf scene in 2013. Forest Dunes has been largely lacking in lodging options despite its out-of-the-way location (Grayling, 20 miles away, is biggest nearby town). Now, however, Forest Dunes is prepared to welcome overnight guests. The Lodge has 14 luxury rooms and suites. Its 28 beds can accommodate 32 people, plus it’s located 35 yards from the No. 1 tee. Six cottages, built 10 years ago by Forest Dunes’ original owners, can accommodate another 30 comfortably. “But we never marketed them,’’ said Campbell. Now the effort to do that is on. Though snow had to be shoveled off some spots on the course a week before its 2013 opening Forest Dunes reported 188 rounds on some weekend days in early May, which exhausted the supply of golf carts available. Various promotional efforts, particularly on social media, obviously got the word out about the rebirth of the place. Forest Dunes’ clubhouse includes the upscale Sangamore Restaurant, appropriate for weddings and proms in addition to business gatherings, and the Kendall/Seltzer Golf Getaway School flourishes with a 10-acre practice facility. Dave Kendall is a two-time Michigan PGA Teacher-of-the-Year and Jack Seltzer a member of the Michigan Golf Hall of Fame. In truth, Forest Dunes has had an interesting history. A group of investors from Arizona got the project started. They envisioned a very exclusive private facility and hired Weiskopf, whose Michigan design work includes the well-regarded Cedar River layout at Shanty Creek, in Bellaire. “They wanted to build a phenomenal golf course in an unbelievable setting in Central Michigan,’’ said Campbell. That wasn’t an easy thing to do at the time. Weiskopf was still moving dirt when financing was shifted to the Carpenters Union Pension Fund. The course was well-received upon its opening and a clubhouse was built in 2004, but the Pension Fund tried four different management companies and couldn’t decide what direction to take. Should it be exclusively private? Should it be a high-end public layout? Should it be something in between? In 2011 the course was put up for sale, and that’s when Lew Thompson entered the picture. A recreational player, he has only dabbled in golf. From Huntsville, Ark., he made his fortune in the trucking industry but his arrival was just what Forest Dunes needed long-term. He used that truck to haul poultry from nearby Arkansas farms, and his business grew from there. Now Lew Thompson & Son Trucking delivers nation-wide. Thompson’s introduction into golf came when he bought a Jack Nicklaus-designed layout, The Bridges, in Montrose, Colo. He immediately fired Troon Golf, its managing company, and the general manager. That GM moved to Forest Dunes, which was then under Troon management, and advised Thompson to consider buying that course. He eventually did, then hired Campbell in January, 2012. Thompson’s been largely a hands-off owner, as Campbell combined duties selling real estate with managing the course. He had no interest in making Forest Dunes a private facility, but it still has members from the previous ownership. His goal now is to put Forest Dunes on par with Arcadia Bluffs and its beautiful lakeshore setting. The next step in that process came in June, 2013, when Campbell announced the hiring of Chad Maveus as the club’s head professional. A Northern Michigan University graduate, Maveus had been an assistant for nine years at California’s Pebble Beach Golf Links.